***One Owner***45k Original Miles ***100% AUTOCHECK GUARANTEED***Gas Saver***Eco Friendly***Coupe Se***2013 Hyundai Elantra Coupe SE Eco Friendly Gas Saver*** Visit our website at www.loanstarmotors.com t o view 60+ pictures of this vehicle ***WE FINANCE***AS LOW AS 3.99% APR FINANCING ON QUALIFIED VEHICLES W.A.C. ***Another fine pre-owned vehicle offered for sale by Loan Star Motors of North Houston Humble TX * Contact our Sales Department for Complete Details at any Time at Toll Free *** 1- 800-651-1718 *** Everyone hates the gas pump. Skip a few gas stations with this super fuel efficient HyundaiElantra Coupe. You can tell this 2013 Hyundai Elantra Coupe has been pampered by the fact that it has less than 45,076 miles and appears with a showroom shine. 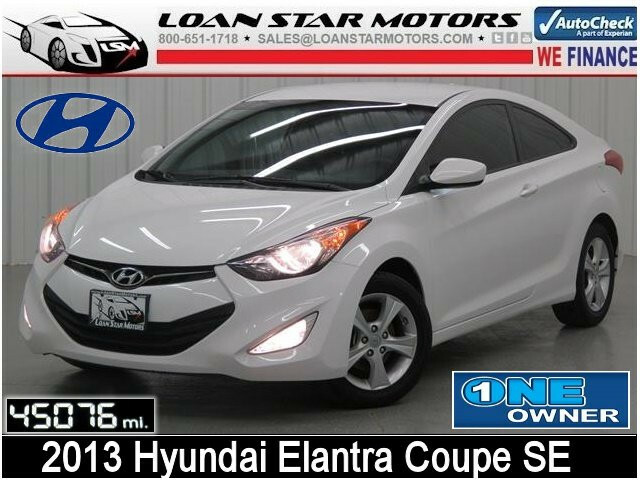 Enjoy the peace of mind knowing this Hyundai Elantra Coupe comes equipped with a manufacturer's warranty. More information about the 2013 Hyundai Elantra Coupe: The Elantra is Hyundai's entry into the compact car market, competing with household names such as the Honda Civic and the Toyota Corolla. It is a competitive segment, but Hyundai hopes its standout styling, high level of equipment and outstanding warranty are enough to convince buyers that the Elantra is the car to have. Starting at $16,695, the Elantra has plenty of standard features and even manages to top 38 mpg on the highway, while offering much more than just basic transportation. Strengths of this model include Economic, practical, and well-equipped and available in a variety of body styles. ***WE OFFER NATIONWIDE FINANCING OPTIONS * COMPETITIVE RATES, DISCOUNTED SHIPPING AND WELCOME TRADES * Extended Warranty Programs/Low APR Financing Available WAC. Physical Address: 5547 FM 1960, Humble TX, 77338-Toll Free 1-800-651-1718 - Visit us on the web at http://www.loanstarmotors.com All advertised prices exclude government fees and taxes, any finance charges, any dealer document preparation charge, and any emission testing charge. The price for listed vehicles as equipped does not include charges such as: License, Title, Registration Fees, State or Local Taxes, Dealer Prep, Smog Fees, Credit Investigation, Optional Credit Insurance, Physical Damage of Liability Insurance, or Delivery Fees. DEALER makes no representations, expressed or implied, to any actual or prospective purchaser or owner of this vehicle as to the existence, ownership, accuracy, description or condition of the listed vehicle's equipment, accessories, price, specials or any warranties. Any and all differences must be addressed prior to the sale of this vehicle. Your actual mileage will vary depending on how you drive and maintain your vehicle. ***One Owner***45k Original Miles***100% AUTOCHECK GUARANTEED***Gas Saver***Eco Friendly***Coupe Se***2013 Hyundai Elantra Coupe SE Eco Friendly Gas Saver***Visit our website at www.loanstarmotors.com to view 60+ pictures of this vehicle ***WE FINANCE***AS LOW AS 3.99% APR FINANCING ON QUALIFIED VEHICLES W.A.C. ***Another fine pre-owned vehicle offered for sale by Loan Star Motors of North Houston Humble TX * Contact our Sales Department for Complete Details at any Time at Toll Free ***1-800-651-1718*** Everyone hates the gas pump. Skip a few gas stations with this super fuel efficient HyundaiElantra Coupe. You can tell this 2013 Hyundai Elantra Coupe has been pampered by the fact that it has less than 45,076 miles and appears with a showroom shine. Enjoy the peace of mind knowing this Hyundai Elantra Coupe comes equipped with a manufacturer's warranty. More information about the 2013 Hyundai Elantra Coupe: The Elantra is Hyundai's entry into the compact car market, competing with household names such as the Honda Civic and the Toyota Corolla. It is a competitive segment, but Hyundai hopes its standout styling, high level of equipment and outstanding warranty are enough to convince buyers that the Elantra is the car to have. Starting at $16,695, the Elantra has plenty of standard features and even manages to top 38 mpg on the highway, while offering much more than just basic transportation. Strengths of this model include Economic, practical, and well-equipped and available in a variety of body styles. ***WE OFFER NATIONWIDE FINANCING OPTIONS * COMPETITIVE RATES, DISCOUNTED SHIPPING AND WELCOME TRADES * Extended Warranty Programs/Low APR Financing Available WAC. Physical Address: 5547 FM 1960, Humble TX, 77338-Toll Free 1-800-651-1718 - Visit us on the web at http://www.loanstarmotors.com All advertised prices exclude government fees and taxes, any finance charges, any dealer document preparation charge, and any emission testing charge. The price for listed vehicles as equipped does not include charges such as: License, Title, Registration Fees, State or Local Taxes, Dealer Prep, Smog Fees, Credit Investigation, Optional Credit Insurance, Physical Damage of Liability Insurance, or Delivery Fees. DEALER makes no representations, expressed or implied, to any actual or prospective purchaser or owner of this vehicle as to the existence, ownership, accuracy, description or condition of the listed vehicle's equipment, accessories, price, specials or any warranties. Any and all differences must be addressed prior to the sale of this vehicle. Your actual mileage will vary depending on how you drive and maintain your vehicle.